This guide to "Kung Fu", the 1970's television series shown on ABC and produced by Warner Brothers, relates the quotations from the show to the real history of the times and to the philosophy those quotations come from or refer to as it follows the adventures of Kwai Chang Caine played by David Carradine. The site covers a series guide, an overview, the pilot movie, seasons one, two & three, and notes (including information on the various books written about the show or its subject matter). We also offer a plain version for print outs but it isn't kept up-to-date with changes we make. In addition we have an addendum (containing a collection of quotes from the show done by Steve Geller), links to information on the show and China, and its history and philosophy as well as other related resources. 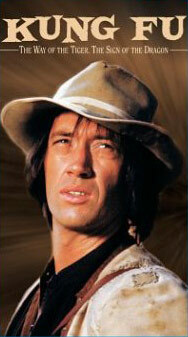 Although this website and guide is about the fictional character and world, we are saddened by the recent death of David Carradine who added so much to this series being the classic it is 40 years after the original broadcast. If you are looking for tapes/DVDs of the show or where it is playing, check out our News and Frequently Asked Questions pages.